First of all, I had no clue that another name for Squash was Acorn. Secondly, I would not have suspected it to be so healthy and full of nutrients. That shows once more that there is so much more to learn, huh?! A variety of winter squash, acorn squash is so named for its nut-like shape. 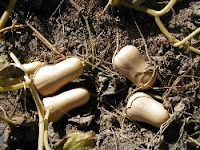 Among squash varieties, acorn is the top Super food for your Heart. A 1/2-cup serving of baked acorn squash (103g) is a good source of heart-healthy nutrients such as fiber, magnesium, potassium, vitamin C, and vitamin B6, as well as manganese and thiamin. Acorn squash is also an excellent food for athletes, providing 20% of daily thiamin, low levels of which may impair sports performance. Choose a dark green acorn squash (with up to one-half the squash yellow-orange) that is firm, smooth-skinned and heavy for its size. It's wonderful stuffed or pureed in a soup. One-half cup baked contains only 57 calories. Squash is not something that is known and consumed in The Netherlands. I had not heard of or tasted it before I came to the States. Since then, I had a taste of a squash dish twice and I liked it a lot. I have not prepared it myself at all yet, simply because I don't know how to prepare it. Maybe it is time to learn that as well, but for now don't ask me for a recipe! Grin. I know there are lots of recipes which can be found online. That reminds me to consult some of the cook books I have. I have no doubt I can find a good recipe in there which teaches me to cook with acorn. How silly of me not to think of that in the first place.